Jalapeno growing shrub‎ of the genus Capsicum also known as Jalapeño or Jalapenio, Jalapeno perennial evergreen but can grow also as annual plant and also used as ornamental plant, can grow in tropic, subtropical, mediterranean, temperate or desert climate and growing in hardiness zone 10b+ as perennial 2+ as annual. Fruit color red cultivar pepper but usually picked and eaten while still green or purple. 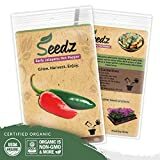 What can be done with big quantities of Jalapeno fruits? 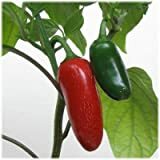 Senorita Jalapeno – The jalapeno pepper, rated at a tenth of the heat level of a normal jalapeno (400 Scoville scale units). 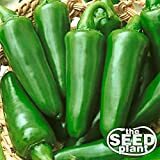 A standard Jalapeno pepper with improvements in earliness and yield is the Jalapeno Early which is rated at 5000 scoville heat units. 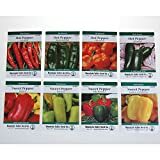 Mucho Nacho Jalapeno are shorter fatter plants than the Early Jalapeno and rate in the 5500 SHU. Rome Jalapeno and the excellent Biker Billy rated at 9000-10,000 units respectively. 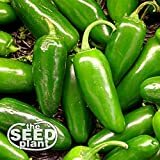 Jalapeno M. are of medium size and have a nice flavor and heat to them. Firenza Hybrid is hot and of good size while Jaloro has a unique range of colors that matures from yellow to orange to red that is quite appealing.